The Leon County 4th of July Rodeo........FUN FOR THE WHOLE FAMILY!! All your favorite rodeo events and more!! Come see the Catalena Cowgirls perform! Their salute to our service men and women is heart warming and something to see. They performed at the 2001 Olympic Torch Ceremony and The Houston Livestock Show and Rodeo plus a long list of events across the nation. Professional Funnyman Coty "Wizbang" Cooper will keep you entertained throughout this great event. Kids 8 and under can participate in the Mutton Busting (pre-enter to receive a FREE tee shirt @ 903-536-7689, $15 entry, can enter both nights) Buckles for Winners!! 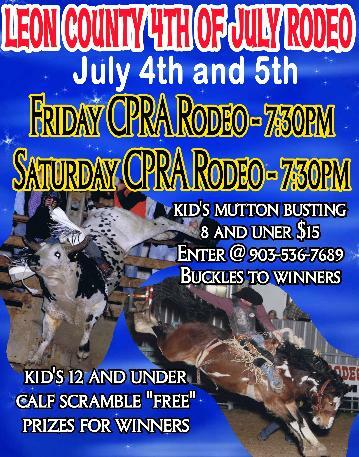 Kids 12 and under can participate in the Calf Scramble!! Prizes for Winners!! Come see us July 4th and 5th for the Leon County 4th of July Rodeo! !